You don't get the change to employ advisory skills until you can get someone to trust you enough to share their problems with you. The way to be as rich as Bill Gates is to care more about writing code than about being rich. And the way to be a great advisor is to care about your client. 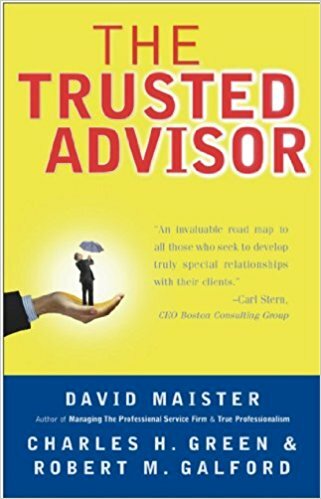 A common trait of all these trusted advisor relationships is that the advisor places a higher value on maintaining and preserving the relationship itself than on the outcomes of the current transaction, financial or otherwise. View methodologies, models, techniques, and business processes as mean to an end. They are useful if they work, and are to be discarded if they don't; the test is effectiveness for this client. Believe that success in client relationships is tied to the accumulation of quality experiences. as a result, they seek out client-contact experiences, and take personal risks with clients rather than avoid them. Believe that there is a distinction between a business life and a private life, but that both lives are very personal. They recognize that refined skills in dealing with other people are critical in business and in personal life; the two worlds are often more alike than they are different. It is not enough to be right, you must also be helpful. Since clients are often anxious and uncertain, they are, above all, looking for someone who will provide reassurance, calm their fears, and inspire confidence. We should act as if we are trying to advise our mother or father. Any implied critique is softened as much as possible. No one likes to be told that they must do anything. A successful advisor assumes responsibility for the proper mutual understanding. What makes this person different from the others that I have served? What does that mean for what I should say and how I should behave? "I can trust what he says about..."
"I can trust that he will do..."
Find the fun and fascination. Test whether you're coming too close to the line, or pushing too far, too fast. If you were the client, is this something you would talk about? Don't overrate the downside risk. What are you afraid of? One of you has to make the first move, and it's you! "I can trust that he cares about..."
A need to appear clever, witty, bright, etc. Ask "how do you feel about that?" Shutup and repeat again and again: "Really? and then what happened?" Also again and again "What's behind that?" Is my pulse racing? Why? Why not say so outloud? Emulate Lt. Columbo: "I may be a little slow here. Maybe it's just me, but..."